Phytomedicine is primarily a therapy-oriented Journal. 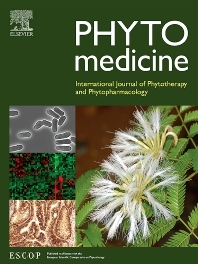 Phytomedicine publishes innovative studies on efficacy, safety, quality and mechanisms of action of specified plant extracts, phytopharmaceuticals and their isolated constituents. This includes clinical, pharmacological, pharmacokinetic, and toxicological studies of specified herbal medicinal products, herbal preparations and purified compounds which have a defined and consistent quality assuring reproducible pharmacological activity. Phytomedicine was founded in 1994 to focus and stimulate research in this particular field and to set internationally accepted scientific standards for pharmacological studies, proof of clinical efficacy and safety of phytomedicines. The main aims of Phytomedicine are associated with the integration of phytopreparations into conventional/official medicine. The directions of Phytomedicine are known to provide profound scientific background in Herbal Medicinal Products, their reproducible Quality and evidence based therapeutic efficacy. Since then quality criteria and standardization methods were defined and the European Medical Agency has elaborated numerous guidelines for the conduction of clinical studies and preparation of Herbal Medicinal Products. In total 107 ESCOP monographs have been produced and submitted to EMA. Many new analytical methods and instruments were implemented both for analysis and standardization of herbal Substances, herbal preparations and their bioassays and tremendous work has been carried out to remain aligned with these intentions during the last 18 years. Nowadays important topics remain to be approached, such as harmonization of the regulatory frameworks in Europe, America, Asia and Australia or the legislation of various "botanicals", where strict differentiation of requirements for health claims of herbal medicinal product, dietary supplements and nutraceuticals are required.